What kind of flowers will you have at your wedding? Will you have flowers at all? When we got married, my floral budget wasn't high on my "must increase" list. I loved the idea of candles, mirrors, beautiful place settings - but flowers? Not a priority. We had some simple arrangements on the tables, some tiny bud vases, and a few arrangements hanging from the ceilings, but that was it. It was perfect, and just what I was looking for. I've seen wedding decor comprised of only candles. I've seen weddings where floral arrangements, branches, and buds spilled from the ceiling, walls, and all surfaces. I've seen a bride carry a vintage cross down the aisle, and I've seen elaborate boutonnières - as well as no boutonnières at all! 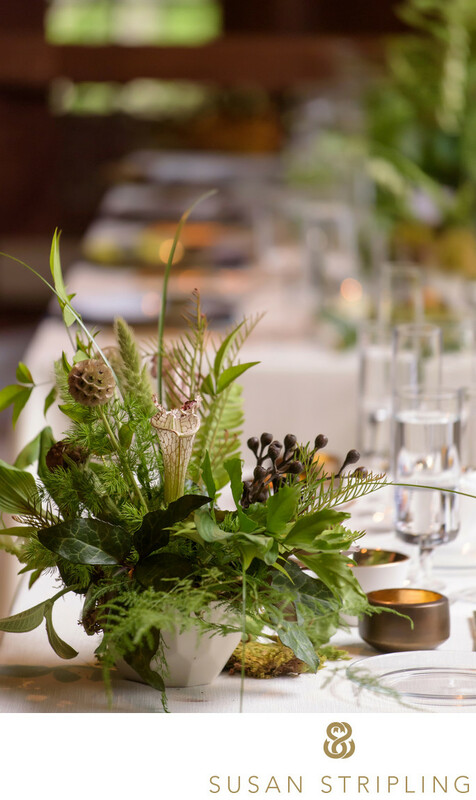 This gorgeous Hudson Valley wedding opted for foliage and ferns, which fit their aesthetic perfectly. If you love flowers, and want to prioritize them as a large part of your wedding day, you should do absolutely that. If having elaborate, large, or complicated floral arrangements is something that you never really envisioned for your wedding, you should absolutely not have them. Don't let anyone tell you that you need to decorate your wedding in a way other than exactly the way you want to decorate it. Carry whatever you want down the aisle. Pin whatever you would like to the lapel of your suit, or don't pin anything on it at all. Your day is your day, and you should decorate it the exact way that you want. Julie Albanese of Sterling Florist created a lovely, simply bouquet for the bride at this Pearl River Hilton wedding. 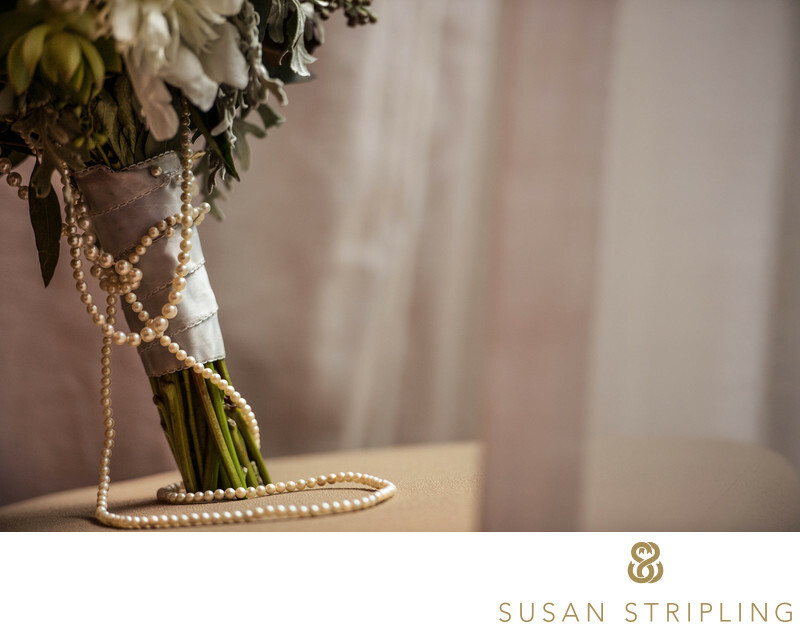 I love how the pearls wrapped around the stems compliments the bride’s gown - as does the blue fabric around the bouquet. The bride’s Oscar de la Renta wedding gown had a gorgeous blue undertone beneath the lace overlay and this blue ribbon matched it perfectly. If you are getting married and need help finding the perfect florist to execute your vision, that's where I can come in! I've worked with amazing floral designers and decorators all over the tri-state area and would love to help you find the perfect person to work with! 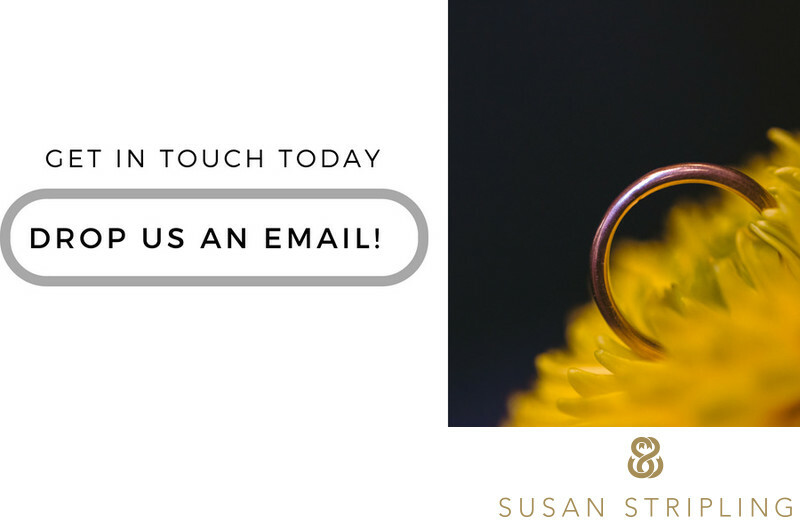 Get in touch and tell me more about how you envision your day looking, and I can help direct you to the best artist to take care of you! Keywords: new york (1395), The Pearl River Hilton (15). 1/400; f/2.8; ISO 1400; 200.0 mm.